The earpieces and connector are highlighted with textured diamond cuts while the rubber touch controls are easy to locate. The cable consists of interior enameled copper wrapped around fiber to greatly increase durability and tensile strength. The upper cable is enhanced by TPE for softness and comfort while the lower is braided with nylon for lasting resilience and tangle resistance. 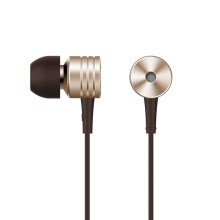 Lightweight piston design fits comfortably in your ears, freeing you to enjoy your music. Beyond comfort, the snug fit increases noise isolation, fullness, and bass. 1MORE’S commitment to a naturally balanced sound, without the harsh bass and treble boosting prevalent with other brands, produces a fully satisfying listening experience without the need for unhealthy volume levels. We truly want you to hear what your favorite artists intended you to hear while protecting your ears. The noise-isolating, crystal-clear MEMS microphone means intimate conversations and crisp sound clarity, while the 3-button remote means on-the-go compatibility with iOS and Android devices. This is Xiaomi Company Partners product.